Epilepsy Research UK > News > Epilepsy Research UK Celebrates Purple Day at the Houses of Parliament! Epilepsy Research UK Celebrates Purple Day at the Houses of Parliament! As many of you will know, since 2008 the 26th March has been known as Purple Day, a day for people around the world to wear purple to increase awareness of epilepsy. This year our research manager Caoimhe Bennett represented Epilepsy Research UK at the All-Party Parliamentary Group (APPG) for Epilepsy, organised by Epilepsy Action, at Portcullis House. Other charities in attendance included Epilepsy Society, Young Epilepsy, SUDEP Action, and OACS Charity. The APPG was an opportunity to raise awareness of epilepsy and to speak with MPs about issues people with epilepsy experience involving their health, employment, and welfare. Caoimhe also spoke with the MPs about some of our ongoing research projects taking place across the country, and the impact that research can have on the lives of people living with epilepsy. There are over 600,000 people in the UK with a diagnosis of epilepsy, and several MPs took the opportunity to share their personal experiences of epilepsy. 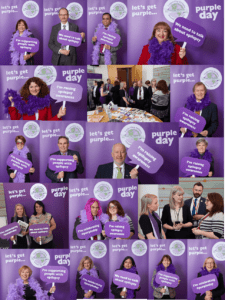 There was also a photobooth with lots of purple props for MPs to use – see below for some of the photos from the day! Staff at Epilepsy Research UK also got into the purple spirit, wearing purple and even turning our website purple for the day! A big thank you to secretariat to the APPG Epilepsy Action for inviting us to take part, and to Paula Sherriff MP, the chair of the APPG for Epilepsy. Pictured: Charities: Epilepsy Research UK, Epilepsy Society, Epilepsy Action, Young Epilepsy, SUDEP Action, OACS Charity and FACS Aware. MPs: Valerie Vaz, Teresa Pearce, Sharon Hodgson, Sandy Martin, Ruth George, Rupa Huq, Mohammad Yasin, Gill Furniss, Kate Green, Lesley Laird, Emma Hardy, Diana Johnson, David Drew, David Amess, Danielle Rowley, Bambos Charalambous, Andy McDonald.